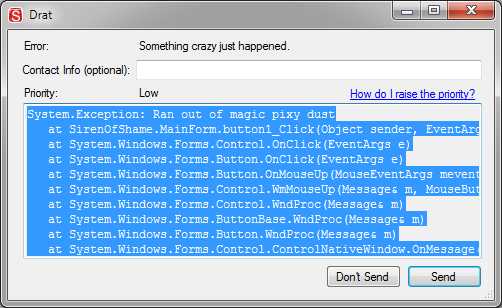 Ever seen something like this while running the siren of shame software? When you click the send button it shoots us an e-mail with the stack trace, and (as of version 1.6) some optional contact information. This dialog represents one of three ways to submit bugs. In addition to in-app bug reports we additionally welcome your patches and pull requests, and as described in how to report bugs we accept bug reports through Google Code. That will allow us to start a dialog with you, gain context into your error, request relevant parts of your log files (see how to report bugs), try very hard to reproduce your error, and allow others with the same error to diagnose their problem and sign up for status notifications. We welcome in-app bug reports, we prefer Google code issues, we really love patches pull and requests. Regardless we appreciate all your help in making Siren of Shame the best build monitor software around.